Tried out my mates one the other day and was really impressed, diamond shaped tray has wee alleyway to line up primers that then get LIFTED into place by what looks like 2nd bar lifting with primer seater,first primer goes into pocket then 2nd one and 2nd one only gets in place for next shell,unlike my old round model that always has me paranoid if double movement is used as 2nd primer can easily go under first one. I,ve had one for about 5 years, it is a good bit of kit. To double feed and really stuff up would require the hand strength of Hercules and the mechanical sympathy of a house brick. You know how its supposed to feel when a primer goes in correctly, you pick up immediately if things arent right. I prefer the hand primer to the ones on the press. I often thought I should get one of these tools. However, I don't load a batch of rounds at a time. I load just what I need and its a mix of primers and brass so I haven't seen were one of these would be an advantage. If I loaded up 50 or 100 at a time, yes. I load about 1000 at a time... I use the RCBS square tray version and love it. I very seldom load more than 20 at a time and find it quick and easy,mate who was teaching me to reload is benchrest guru and said it was a very good unit (old model) and thats more than good enough for me. I just replaced one of my old Lee hand primers with the RCBS model and it is a very different device that I had to get used to. It worked fine - other than the first shell holder not fitting properly. I had to file the stem on the primer to get it to fit. I had a few times where the primers flipped in the tray when shaking it to feed the primers into the feed slot but since working with it that has stopped happening. The RCBS priming tool has a "better feel" as to when the primer is seated but I never had any problems with high primers with the Lee primer either. I do like that the RCBS tool uses the same shell holder as the press which means that I don't have to go out and buy new shell holders for it. I usually load more than 100 rounds at a time and often up to 500. Doing them in batches is faster and I am less likely to make mistakes doing it that way. (just me I'm sure) I broke the primer in loading 400 9mm rounds and two hundred 357 rounds. The next group will be some 223 and 7mm TCU rounds. I will load about 100 rounds of the TCU for my pistol and 400 rounds once I get a good load for the 223 rifle that I have not yet committed to. I have to load some 357 Maximum rounds, some 257 Roberts, 358 winchester and some 30-30 rounds for my carbine. I always use a hand-held priming device, unless I'm using the progressive press of course. Even if I'm only loading a few for testing. I've been using an old Lee, with the round tray, for many years but thinking about "upgrading" to something with a square tray that actually fits the tray the primers come in. Suggestions? As above I have used and recommend the lee unit, I havent used the rcbs unit so cant comment on it. I've used Lee hand-primers for years. I always use hand-priming for all rifle cartridges, which allows a final case inspection and a precise feel for when a primer bottoms out. 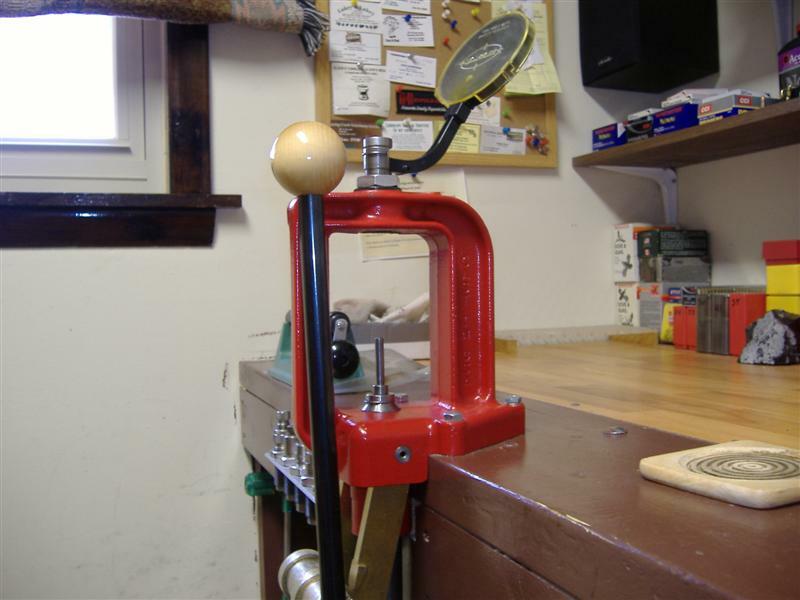 Pistol brass is primed on the press since I use progressive presses. Over the last several months I have been using an RCBS "ergonomic" tool with universal case holder. I doubt if I will go back to anything else. Tray fits most primer boxes for easy fill and the grip allows both sensitivity and leverage...very important for tight primer pockets such as Nosler brass. I like the look of the RCBS Universal Tool, but it's God awful expensive...price ranges between AUD$130 and AUD$165. Oh well, I just continue to use the priming arm on my single stage O Frame press. Wow, I only gave $49.99 (US) for mine and OpticsPlanet offers them for $62.19 through Amazon right now. That's quite a difference. Since Bushy shown his priming tool a few years ago, been using it without any problem. I like the look of your setup there Bushy...much easier than the ole priming arm arrangement I'm using. Hm...might have to investigate this methinks.